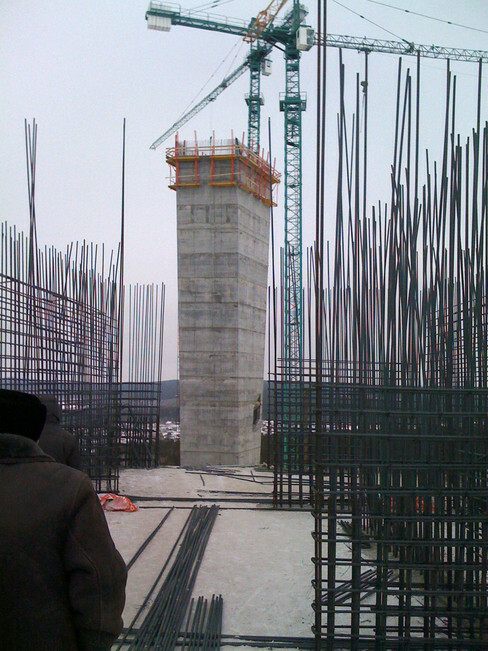 This jump, being constructed in Kazakhstan, features a single tower with two areas of relief, which represents an innovation in such a typology. The newly constructed hill is a sculptural element, generating the form of the two curves at the flanks of the start-up tracks. The V-shaped widening towards the top of the tower recedes in a twisting motion above. The double-curved edges are perforated by apertures, which relate to the rail curves of the base geometry of the surface. On the west side of the sports center, down the down is a convex curvature, while it reverses into a concave formation on the east side. The slender steel truss structure of the start-up tracks give the sense of machined parts resting on the concrete tower, thus differentiating themselves from the rest of the structure. The judges tower sits at the north-western edge of the arena. The grandstands lead directly into the building, and form the back wall terminating the area. 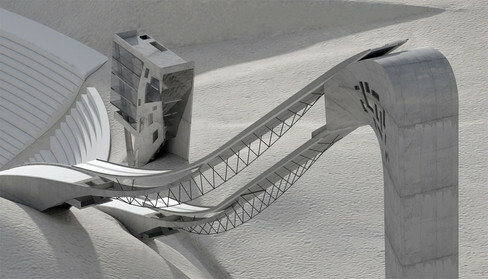 The jump takes on the geometrical identity of a multi-curved perforated surface for the surface of the ski jump tower. This surface is perforated only by the cabins of the judges. 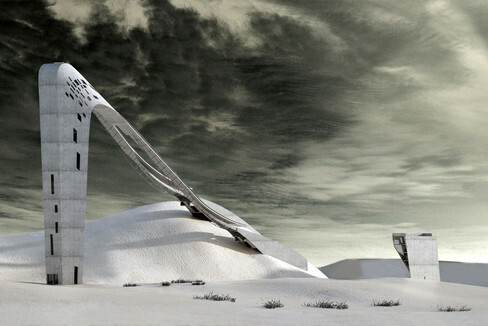 The development is a grated structure, with both protected and open areas. Concerning landscaping - For conservation reasons, there was an early decision against extensive excavation and the construction of artificial embankments. 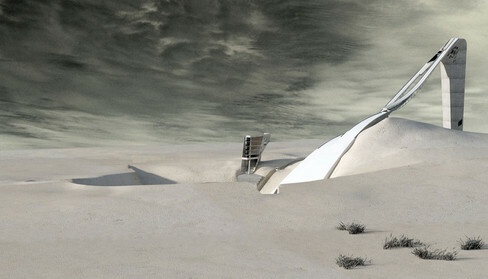 The artificial crater planned creates a landscape much more empathetic to its context than that created by an additive process. The harmonious lines of the jump flow along the landscape, which is shaped by the informed placement of the stands and stages. The stands are designed to accommodate 21,860 spectators. This is partially possible due to the natural variation in topography, and partially through the construction of stands meant to increase the maximum possible audience. The cross-sections of the grandstand will have a parabola-like form, sloping steeply upwards, causing the desired 'cauldron' effect. 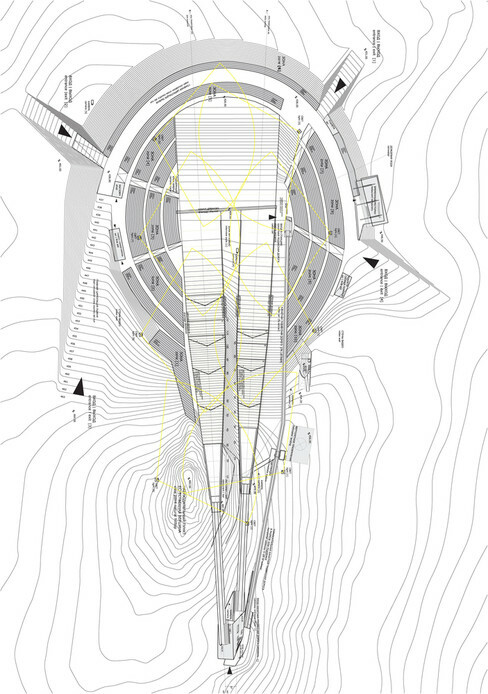 The location of the ski jump is determined by the prevailing wind direction, the topographical necessities in the area of the jump area, and the siting of the adjacent sports centre.